The energy bar section of the grocery store is so loaded with options that one could spend hours reading labels attempting to determine which product is lowest in sugar, highest in protein, has the healthiest fats, made of the most natural ingredients, etc. Let me save you some time. Remember one name – Hornby Island Energy Bars. 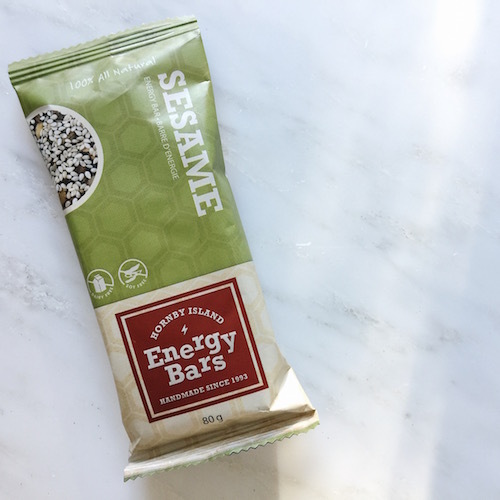 Made on (you guessed it) Hornby Island, Canada, these bars are soy-free (thank you! ), dairy-free, made with limited ingredients (most of which are organic and/or fair trade), and taste amazing. They may not be your cheapest option, but they will be worth it!